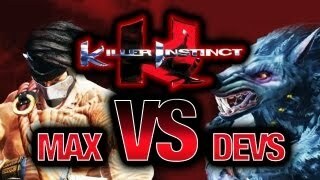 Maximilian has had the privilege of playing Killer Instinct early on numerous occasions. While the San Diego Comic-Con event was in full swing, Max got his hands on the game once again. Mad Catz and Team Sp00ky held an event at the Reuben H. Fleet Science Center during the 2013 San Diego Comic-Con weekend. There, Maximilian was able to play Killer Instinct with the developers of the game. Above you will see how he fared in part one.